Every now and then, households get to face the herculean problem of a leaking shower or a dripping shower. Just only the sound of drip… drip…drip… from a shower head or any other part of the shower is enough to drive any homeowner insane. Both leaking shower and dripping shower are considered a common household problem, that leads to a considerable waste of water and money. A dripping shower head or shower is annoying, owing to the dripping sound it makes, and damages it causes. Typically, a dripping shower often results in two types of drips; slow drip and fast (steady drip). Over time it leads to an increase in water bills and grout starts to mould and decay. In addition, it can also result in staining and rust near the drain. So, what causes a dripping shower? Typical causes of dripping shower include loose and worn out parts such as valves or faucets, and sometimes the shower head itself. It could also be that the shower tap is not turning off entirely. Unlike a dripping shower that the cause is mainly surficial, a leaking shower, on the other hand, implies that there is an underlying problem. The damages caused by a leaky shower are more severe and even catastrophic. Damages range from structural damages, mould buildup, foul stench, and odour, metal failure as a result of rust, wood failure as a result of the accumulation of moisture and so on. Whereas the effects of a dripping shower are only seen on the shower head, the effects of a leaking shower can be felt across the entire house. Poor plumbing is usually the number cause of leaking shower. The entire plumbing work of a house could be so poorly done, that certain problems will arise, sooner rather than later. 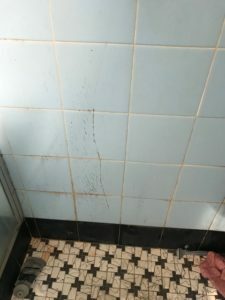 Other causes of leaking shower include, wear and tear, poor quality of materials hostile cleaning products, and movement of the building leading to loose joints, uneven floor, and damages to plumbing work. Both dripping shower and leaking shower shouldn’t be taken lightly. If you discover any signs of them in your home, quickly put a call through to a professional. Swift action will save you a lot in terms of damages and cost. 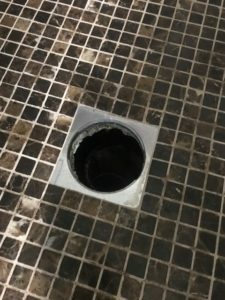 Why you should fix your leaking shower quickly? Not only is a leaky shower discomforting, but it can also quickly become a nuisance to you and your family. Often most homeowners would rather live with the damage, and manage the leak the best way they can, but this often results in several other complications and severe damages. There are several instances where homeowners are even unaware that their shower is leaking, and this can go on for days, and weeks underneath the shower recess or even behind walls. 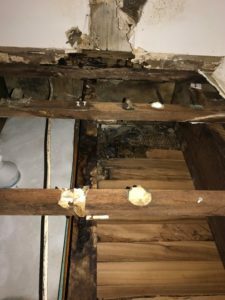 Although the signs of a leaking shower might not be evident at first, the damage done can be astronomical if it is not promptly treated by a professional. If you are still indecisive about whether or not you should fix your leaky shower immediately, the following reasons may help convince you to take swift action. Leaky showers can cost severe structural damages to your property if left unattended to. You might face severe damages to your floors, walls, and the foundation of your home and this might make your home uninhabitable for a certain period. Such damages might cost you a good amount of money to repair and even replace. 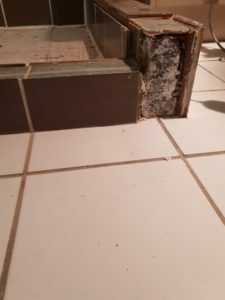 The accumulation of mould as a result of a leaking shower results in the buildup of problems on two fronts; firstly, it can lead to health complications such as respiratory problems, allergies, and hypersensitivity. Secondly, it can result in certain structural damages to the wooden parts of your home, resulting in unpleasant odour around your house, and also unpleasant sights. The perfect breeding ground for white ants is a combination of moisture and timber. The accumulation of moisture by the wooden parts of your home due to a faulty shower will attract white ants into your home, and their numbers can rise from a couple of hundred ants to thousands if the leak lingers on. 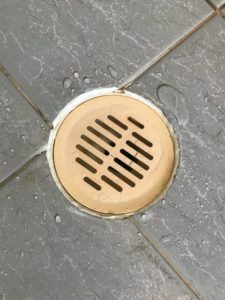 A continuous shower leak can result in the development of rust, and this gradual affects all the materials around it, and if the leak is not repaired on time, the metal will deteriorate leading to structural failure in most cases. A persistent shower leak on the wooden parts of your home can lead to the saturation of the wood supporting the base of the enclosure. 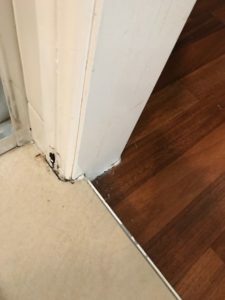 Continuous exposure of the wood to moisture can cause; deterioration of the wood, facilitate the growth of mould, provide a breeding ground for white ants, and even lead to offensive odour around your home. Damages to grout in your home. A leaking shower shouldn’t be taken lightly, and should you discover you have one in any part of your home, it is essential you put a call through to a professional. Quick action from you might just be what saves you from health problems, severe structural damages, and even costly repairs. What things should you look for when hiring a bathroom or shower sealer? Given the number of homes, houses, and properties that already exist and those that spring up on a daily basis, there is an increase in the number of properties that require a sealer. Homeowners and property owners now require a reliable and reputable sealing company to help with their sealing needs. 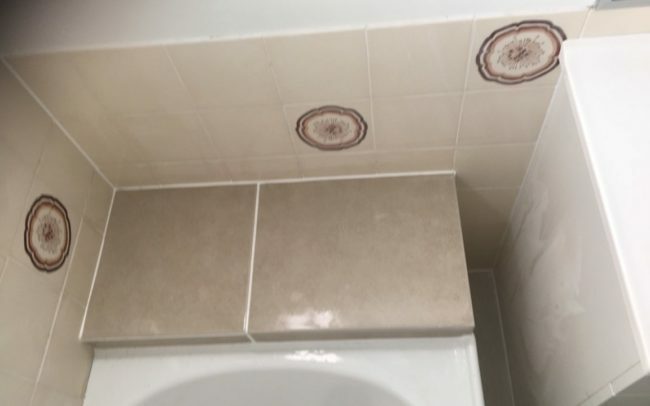 Whether it is your bathroom or tiles, it is essential that they are correctly sealed if you want to enjoy them for a long time. But with the given rise of sealers and sealing service providers homeowners and property owners have to be careful about who they hire as not everyone is capable of delivering an effective and efficient job that is dependable and cost-effective. Experience tells you that a sealer has the ability and skill to handle your sealing job, and it also tells you that they will do the job effectively. Experience also shows you that a sealer has been in sealing business for a long time. That’s the kind of sealing service provider you want to look out for and hire and not some novice who might do a poor job and live you scratching your head or do more harm than good. Before you go out to hire a sealer, check how long they’ve been in business. Whether you are a small-time homeowner or you’re a big-time property owner, you want a sealer that works on a particular agreement plan without compromising on the quality of their service. Being cost effective is always a good sign that a company is responsible. Also, remember that cheapness doesn’t always equate to a satisfactory job. One essential requirement you must look at for before hiring a sealer is the quality of work they render. Before hiring any sealer service provider, check their previous performances and ask around from family, neighbours, staffs, and acquaintances about them. You can check out their past reviews and recommendations. All these checks are to ensure you are hiring a reliable outlet and not some quacks that may leave you even in a more precarious situation. These guidelines are to make the selection process for a reputable sealer easy for you. 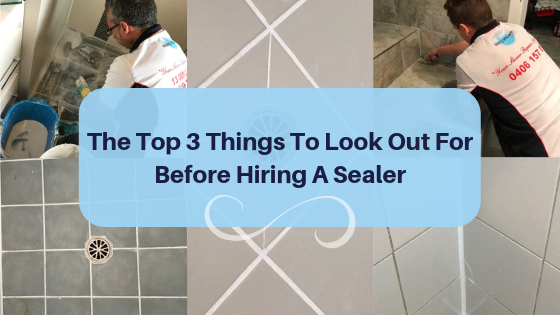 So, when next you want to hire a sealer don’t forget to look for these characteristics and qualities. If you follow these steps, you can have the peace of mind that you are hiring a sealer that will give you a top-quality job, and ensure you get the right value/service for your money. Showers serve as a place of comfort and relaxation. It is one place in your house that you visit at least once a day and It is most likely the first place you pop into in the morning and obviously the last place you visit just before you jump into your bed. It is because of these frequent usages that showers require more maintenance than any other part of your home. 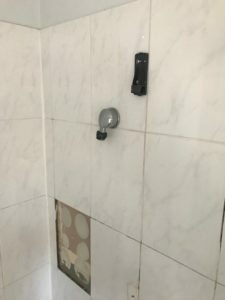 If you have the slightest of feelings that your shower no longer provides you with the comfort that you desire, it is probably time for you to renovate it. The following hints below tell you if it’s time for a shower renovation. Old age comes to us all, even our showers. The tiles are a perfect indicator that your shower is old and in need of a renovation. You would observe broken tiles or cracked tiles on the walls of your shower and also on the floor. 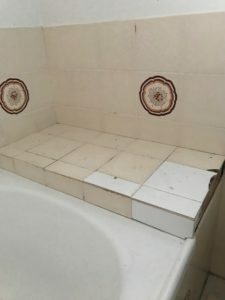 In as much as you would rather manage your shower like that with the damaged tiles, it is very unhealthy and can prove a serious risk to your physical health. You wouldn’t want a situation whereby a ceramic shard from of the broken tiles cuts your foot. Cracked tiles and worn out tiles should not stand for a long time without renovation and repair. A continuous leaking shower head along with a leaky faucet or two might just be a clear indication that your spindles behind your shower taps are due for a service. Leaks are an eyesore and when they are continuous, they can be a major problem not only to your shower but also your back pocket. One place you would always go into every day is the shower. You would have to agree with this fact; most leave their showers outdated and looking tacky. Your shower is your safe haven and as such, it ought to be treated as such. Prime it up a trendy new look that is fitting. You might want to sell off the house and a beautiful shower might just be what seals the deal. If you feel the space in your shower can’t handle your family needs, a shower renovation is just what the doctor ordered. A little expansion and a new layout would make your shower more efficient and give it a brand-new feel. At Leaky Showers, we know how to carry out small shower rebuilds or complete renovations. We will make the process as seamless for you as possible and will deliver your new shower in a timely manner. 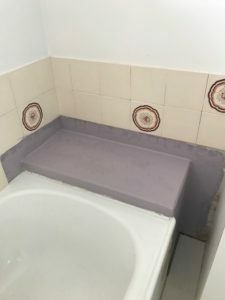 All the hard work of renovating your shower or bathroom will be done in no time at all. Below: Images of what your shower may look like if you find yourself in need of a rebuild or shower renovation. Crack on very outdated back wall tiles. No support under floor waste and it fell through. 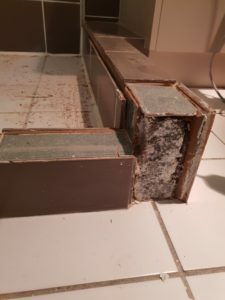 Tiles falling off wall due to being glued with silicon filler. Floor waste sinking through floor. 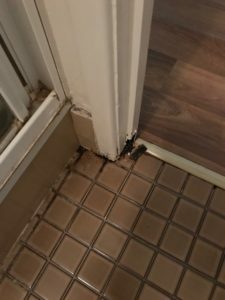 Leaking Shower – What Am I Looking For? What are the signs of a leaky shower? A leaking shower can create major problems, apart from mould and damp in walls, a leaking shower can lead to building issues and structural failure. Do you know the signs of a leaking shower? There are numerous signs to look for and many do not only appear in the bathroom area, they can also manifest in other locations around the home. Most of the doors/architraves and skirting’s are made from wood or a compressed wood compound. These materials have a tendency to swell when they come in contact with moisture over a period of time. Look for swelling or discolouration; this may be an indication of escaping water. Look at the bottom of your architraves door jams and skirting in the general area of the bathroom. 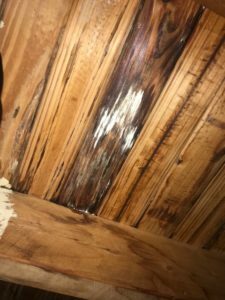 If there has been a leak for a long period, you may see rotting timber, this is a serious sign and the leak must be stopped immediately before more damage can be done. Loose tiles are a very common sign of a leaky showers and moisture damages. 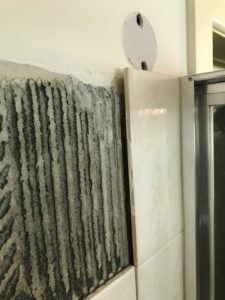 This is due to the fact that the adhesives put in place to hold the tiles are weakened and damaged by the moisture building up behind them. Look for a warped surface on the wall, which can cause a shift in the tiles. If you observe your walls and ceiling closely and regularly, you can get a hint if there is a water leak. Water leaks from leaking showers can lead to degradation and weakening of ceilings and walls. Look for water stains to walls and ceilings and changes to surfaces i.e loss of shine and aesthetic appearance. When it comes to a leaky shower, the smell of rot is usually what gives it away in most cases. Our walls are a mixture of various materials like wood, cement, and mortar. 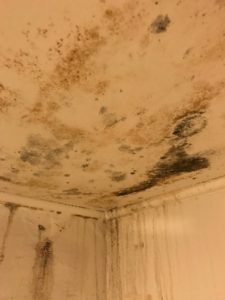 Moisture from a leaking shower causes these materials to decay and weaken which usually leads to a very unpleasant smell around the house. These smells can be attributed to rotting wood, mould and point to a high probability that there is a major leak in the house. Apart from the degradation and wear of materials, moisture also has an adverse effect on paint on the wall and timber surrounds. Look for moisture underneath any layer of paint, gaps or bubbles that form underneath the paint. Look for cracking and flaking paint. Once these are observed it can indicate moisture damage and the possibility of a leaking shower. If paint no longer sticks to the wall, there is an obvious indicator! Grout is the rough sand-like material that is used to fill in gaps between the tiles on your walls and floor. The right grout provides a durable waterproof barrier which compliments the tiles and style of the bathroom. Grout can crack, shrink or fall out and begins to lose its grip due to various reason which can lead to moisture in the walls. Most leaking showers can be repaired without removing tiles at a very reasonable rate. Why do showers leak? Aren’t they supposed to be waterproof? Having everything function in your home the way it was intended to is a beautiful thing. Irrespective of how perfect we want our homes to be, it is unfortunately not always the case. Shower screens, taps, bathtubs or even electrical appliances usually develop one fault or another at some point in the life of the product. Of all the faults that can come up in our homes, a leaking shower stands above the others in how it can affect the running of a home. Think about this for a second, walking downstairs or even into the kids rooms on a Monday morning only to discover a wet patch on the floor along with bubbling paint and damaged walls. It brings a truly horrid sinking feeling in your stomach that makes you wonder “Aren’t showers supposed to be waterproof…how on earth can it just suddenly start leaking”? You don’t need to get yourself stressed out about whether your shower is properly waterproofed or not. The truth is, leaking showers are a frequent occurrence in homes all around Brisbane and the Gold Coast (especially upstairs where there is likely to be more movement) and they can happen anytime to anyone. Leaking showers can cause major problems such as mould, weakening of building structures, cracks to walls, loose tiles and a whole lot of other issues. It is important all homeowners understand why showers leak in the first place and what the major causes can be…Let’s take a look. The shower pictured below was recently re-tiled and it was very well done, as far as tiling goes. It was neat and lined up and at first glance, you couldn’t tell what the actual cause of the leak was. The problem it turns out was that the shower screen was not removed when it was re-tiled, This in turn allowed water to get in behind the tiles which caused a host of issues. The tiles had been fixed with silicon on the inside of the hob and they started to fall off. What are the limitations in waterproofing? In answering the question “Aren’t showers supposed to be waterproof?” Well, the simple answer is…yes! But wait there is a small catch, only a small portion of the shower is actually waterproof and this is called the waterproof membrane. Every other part of your shower is susceptible to water damage. 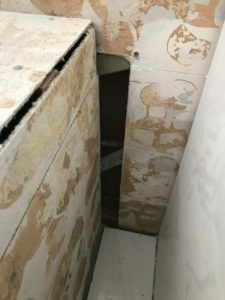 If the shower membrane is poorly installed or develops holes or becomes frail, shower leakages are bound to occur and will only be a matter of time. See below: This hob at the end of the bath, its little wonder why it was leaking every time the kids had a bath! Water just poured through the deteriorated grout and underneath the tiles there was just no waterproofing at all. Has your balcony or shower started leaking? When a pipe leaks, the water will be bound by gravity and the path of least resistance causing it to end up behind bathroom walls and the waterproof membrane. When leaking pipes are the cause of your problems, the repair bill can range from very small or quite expensive depending on where the leak is. 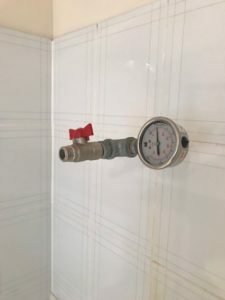 When we provide a quote on repairing a leaking shower the very first thing we do is a pressure test. This allows us to determine if leaking pipes is the problem. This is very important because there is no point in resealing a shower properly if the pipes are leaking behind the shower walls. This picture (below right) shows a pressure test being done on the pipes. We see leaking showers every single day and the symptoms are always the same – water making its way through the walls or floor to the downstairs or adjacent rooms. 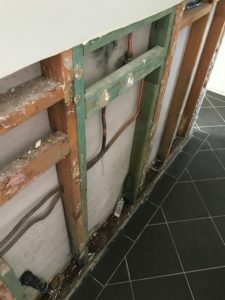 After talking to hundreds of people about their leaking showers and listening to all different diagnoses it is evident that on the surface there looks to be a host of potential reasons for water damage but the problem is actually beneath the surface. The second common reason for a leaking shower is related to the waterproofing. 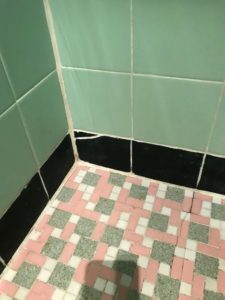 Before tiling, a shower must be waterproofed correctly to ensure any water that happens to get through the grout still finds its way to the waste. Unfortunately, many showers have not been waterproofed correctly if at all. If waterproofing has been done correctly years of use and shifting of the home over time can cause a waterproof membrane to fail. If this happens you have 2 options. Option 1 is to re-seal the shower. This can be done if the leaking has not been left too long causing damage to the walls and floor. By this stage, it really is quite impossible to reseal a shower properly. Option 2 is to rebuild the shower which is often the best way forward if you want to update your shower or bathroom. Leaking tiled balconies differ from showers in that there are no taps, shower heads or pipework that can cause leaks. Below is a picture of pipework that has been fixed for a shower. Balconies also leak due to poor waterproofing or no waterproofing at all. Balconies are exposed to the elements and therefore much harsher conditions than internal bathrooms. This means the floor joints and substructure must be of high quality to withstand this exposure. (Below Right) is a picture of the floor joints being fixed on a balcony. Balconies must also be able to withstand a lot more weight and movement. If not, the chances of the waterproof membrane failing under the balcony increases. Balconies also have sliding doors or windows which add to potential areas for water penetration and therefore leaking. 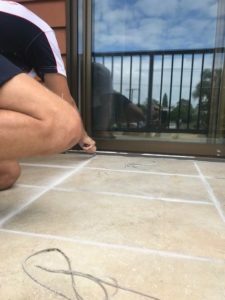 If the balcony is leaking the problem can usually be fixed by re-sealing the entire area without having to remove all the tiles or spending thousands.